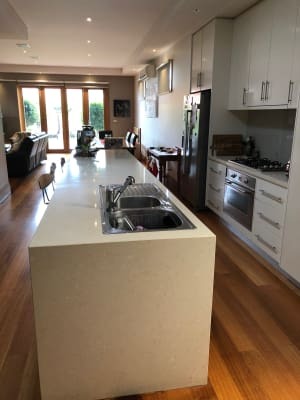 Our house is a clean tidy environment that offers a large communal kitchen including espresso coffee machine, cooling and heating systems in all rooms. We also have a green cosy backyard where you can relax and have a BBQ under the pergola. We have Netflix and High speed internet available. Our home comes with friendly dog called Monty (spoodle breed) that loves to be taken out on walks. Our place is 5 minutes walk from Trains, Trams and buses and is 35min from the CBD. We are also 5 minutes walk from supermakets and a Fresh Food Market (Preston Market). We love to socialise and also respect each others space. I am social person that likes to share Ideas, conversations, a glass of wine or a beer at the end of the day. We have an overseas student doing her masters degree and also have someone that works in his own business. We all have our separate lives but enjoy sharing this homely space.